The What Hi-Fi? archive of 4K Ultra HD Blu-ray reviews | What Hi-Fi? Here at What Hi-Fi? we use a lot of films and TV shows when testing the latest home cinema kit, but we also turn our hand to reviewing them as well. From the latest Hollywood blockbusters to captivating experiences on the small screen, we've reviewed a number of 4K Blu-rays since the format's inception in 2016. With over 200 titles available to buy in the UK – and that's not including the titles you can freely import – there are plenty of 4K discs to choose from. 4K picture quality doesn't automatically mean glowing reviews. The quality, while usually of a high standard, differs from disc to disc, and HDR - in its many variations - can make a difference, too. 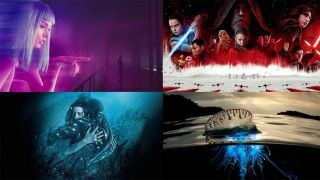 So whether you want something to show off your swanky new 4K Dolby Vision-enabled TV, or a film that will put your (hopefully Dolby Atmos or DTS:X compatible) home cinema set-up through its paces, here are all our 4K Blu-ray reviews in one place. All titles feature HDR10 unless stated so, and we also specify if titles are upscaled to 4K or fully native 4K pictures.